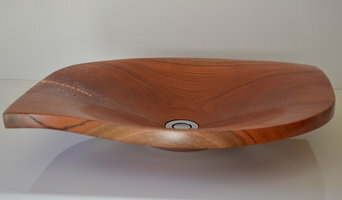 Tom Goldschmidt is the the artist and creator of beautiful contemporary, yet timeless solid timber sinks, each one as unique as the reclaimed timbers they are made of. Employing traditional woodworking techniques his sculptural basins are aesthetic and sensual in design. Tom works exclusively with Australian reclaimed timbers. Each and every piece is unique and sealed and finished to highest standards. About Alternate Splashbacks At a Glance • Specialise in kitchen and bathroom splashbacks • Produce durable alternatives to traditional material used for splashbacks • Combination of durability and unique design We strive to infuse a versatile flavour in your house. We are here to offer you something that you might have always wanted to incorporate into your dream home. We value your aesthetic sense and cater to everything you require to make your place look luxurious. At Alternate Splashbacks, the team of skilled artisans aims to add a hint of glamour in your house. With an extensive collection of splashbacks, we make sure both your domestic and commercial space get revived. The splashbacks are not merely a temporary solution to your household, but the durable range of splashbacks is sure to adorn your walls and floors for a prolonged time. Our Products and Services • Our company makes sure that our clients get the products that meet international standard. • You ought to find vibrant prints on splashback that we supply and install. • Designer innovative splashbacks are one of our fortes that provide your kitchen with a unique dimension. • Our Laminex Metaline products are the perfect alternative to kitchen glass top. • In our range of bathroom splashbacks, the Zenolite products ensure a contemporary look for your washroom. • Our highly qualified and skilled installers make sure that the acrylic splashbacks are perfectly fit to your walls, lending it an unusual appearance. Low maintenance, easy installation process, great design and competitive price are some of the key features of our kitchen splashbacks that make us stand out in the crowd. Moreover, our commitment to quality maintenance has further led us to become a preferable option for our clients. Kitchens and bathrooms are the most renovated rooms in all Newcastle homes where storage is a top concern in these rooms, so hiring Newcastle, New South Wales professionals to create and install custom cabinets or match and fit fixtures that will make your room unique. Use the Houzz Professionals listings to find Newcastle, New South Wales kitchen and bath accessory vendors. Don’t rule out asking a kitchen manufacturer’s design team for help, too. Skills often can be overlapped to save you time and money! Here are some related professionals and vendors to complement the work of kitchen & bathroom fixtures: Kitchen & Bathroom Designers, Kitchen & Bath Renovators, Interior Designers & Decorators, Joinery and Cabinet Makers. Find kitchen and bath fixtures and accessories, plus installation experts, on Houzz. Check out New South Wales kitchen products and installers, and bath plumbing products and installers, on Houzz. You can also look through project photos provided by Newcastle, New South Wales renovators, retailers and designers.